For starters, it was the first Huayra in the US. Just 100 examples of the Pagani Huayra coupe exist. That’s it, and every one of them is special and built to order. But this one, the Huayra Tempesta, is extra special. Why? Because it was the first Huayra to be delivered to a North American customer, who lives in California. It’s also the only Huayra finished in Grigio Scuro Opaco, a dark grey matte paint. The interior is covered in gorgeous beige leather. But what is Tempesta, exactly? It’s an optional package for Huayra buyers with many upgrades, including improved aerodynamics and weight-savings in order to improve performance. Specifically, this package features a new underbody, a front splitter and rear diffuser, new four-way adjustable Ohlins shock absorbers, unique 20-inch front wheels and 21-inchers out back, and a unique exhaust system completely made of titanium. 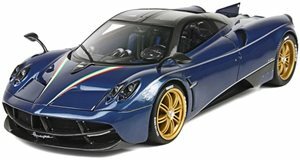 The Tempesta package is offered to all existing Huayra owners, and it alone costs 183,000 euros. Power, of course, comes from the familiar Mercedes-AMG 6.0-liter twin-turbo V12 with 720 hp. As an added bonus, this Pagani comes with an exclusive seven-piece luggage set, originally a $20,000 option. It’s also trimmed in beige to match the interior. With just one previous, original owner, the Pagani Huayra Tempesta has only 640 miles on its clock, and RM Auctions estimates it’ll bring in between $2,200,000 and $2,800,000 at its Monterey event in Pebble Beach next month. We honestly wouldn’t be surprised if it hits or even surpasses the $3 million mark. Photos courtesy of RM Auctions.